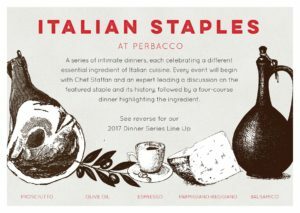 Our new dinner series — Italian Staples at Perbacco — continues this month featuring Prosciutto. Many guests who joined us in May for the first dinner highlighting Parmigiano-Reggiano enjoyed themselves so much that they reserved seats for the whole series and the Prosciutto dinner scheduled for July 19 quickly sold out. We decided to add an additional night to allow us to welcome another group of guests on Friday, July 21 for Chef Staffan’s special Prosciutto menu. With only 16 seats available in our private Barolo Room, the evening will beginning with a tasting of six prosciutti and other hams, a selection of hors d’oeuvres, as well as a discussion with our very own Chef Staffan Terje. Guests will then sit for a four-course dinner showcasing Prosciutto in a variety of dishes. See below for the full menu. This unique experience is priced at $75 per person (excluding tax & gratuity) and our wine director, Lorraine, will have a special wine pairing available for $35. To make reservations for the Friday, July 21 Prosciutto dinner or the rest of the series, please contact Stephen Lee, Director of Hospitality & Private Dining: 415-955-0647 or stephen@perbaccosf.com.